President Donald Trump has warned Syria's government the US is "locked and loaded" to strike again if it carries out chemical attacks. The warning came after the US, UK and France struck three Syrian sites in response to a suspected deadly chemical attack in the town of Douma a week ago. Syria denies any chemical use and says that attack was fabricated by rebels. A UN Security Council vote brought by Syria's ally, Russia, to condemn the US-led strikes was rejected. The wave of strikes represents the most significant attack against President Bashar al-Assad's government by Western powers in seven years of Syria's civil war. While Western powers have supported rebels from early on in the war, they have not intervened against Syria directly. After the failure of the Russian motion, the US, UK and France circulated a new draft resolution to UN Security Council members, calling for an independent investigation into Syria's alleged use of chemical weapons, AFP news agency reported. A similar previous plan had been vetoed by Russia. UK Prime Minister Theresa May has blamed Russian obstruction for the need to launch military strikes, saying they left "no practicable alternative". Isn't an investigation already under way? Inspectors from the independent Organisation for the Prohibition of Chemical Weapons (OPCW) had already been dispatched to Damascus and they are expected to visit Douma this weekend. But the OPCW will not seek to establish - and publicly announce - who was responsible for the attack, which is what the UK, US and France want to see. The new, Western-drafted resolution calls for the OPCW to release their report within 30 days. What happened at the UN? An emergency meeting was held by the UN Security Council on Saturday, leading to some bitter exchanges. Russia sought to secure a collective condemnation of the early morning air strikes. However, out of the 15-member council, only China and Bolivia voted in favour of the Russian resolution. Russia's UN envoy, Vassily Nebenzia, read out a quote from President Vladimir Putin accusing the US, UK and France of "cynical disdain" in acting without waiting for the OPCW's findings. US envoy Nikki Haley said the strikes were "justified, legitimate and proportionate". She said: "I spoke to the president [Trump] this morning and he said, 'if the Syrian regime uses this poisonous gas again, the United States is locked and loaded'." She added: "We cannot stand by and let Russia trash every international norm and allow use of chemical weapons to go unanswered." Syria's envoy to the UN, Bashar Jaafari, said the US, UK and France were "liars, spoilers and hypocrites" who exploited the UN "to pursue... [their] policy of interference and colonialism". Elsewhere, the Syrian army announced on Saturday that the Eastern Ghouta region, where Douma is situated, had been cleared of the last rebel fighters and was fully retaken. What is Donald Trump's reaction? He tweeted early on Saturday, hailing the strikes as "perfectly executed". He also thanked the UK and France. The phrase had been on a banner as Mr Bush declared the end of "major combat operations" in Iraq in May 2003, six weeks after the US-led invasion of the country. The following Iraqi insurgency questioned the validity of the statement. Mr Trump announced the strikes on TV on Friday night, saying the three allies had "marshalled their righteous power against barbarism and brutality". He spoke to Mrs May and French President Emmanuel Macron by telephone on Saturday, agreeing the operation had been a success. The Barzah chemical weapons research and development centre near Damascus was hit by 76 missiles, 57 of them Tomahawk cruise missiles, and "destroyed"
The Him Shinshar chemical weapons bunker facility near Homs was targeted with seven Scalp missiles and was "successfully hit"
He said "none of the aircraft or missiles were successfully engaged" by defence systems and all aircraft had returned. 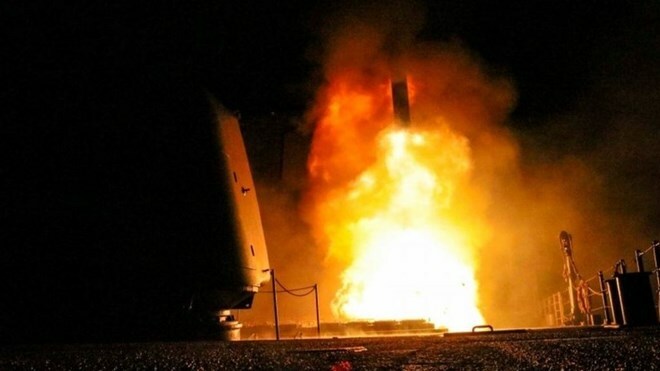 Gen McKenzie said about 40 Syrian defence missiles were fired, mostly after the targets were hit. The Pentagon briefing conflicted with information given at a Russian defence ministry briefing, which said 103 cruise missiles had been launched and 71 were shot down by Syrian systems. Both the Russians and the US said there were no reported casualties. Syria says three people were hurt near Homs. The US said it had communicated with Russia ahead of the strikes through the normal procedures of their "deconfliction" hotline but no details of the attacks were given. There had been concerns that if the allied strikes had hit Russian military personnel, it would have further escalated tension. The US says the scale of the strikes was about "double" what was launched in April 2017 after a chemical attack on the town of Khan Sheikhoun that killed more than 80 people. Gen McKenzie said the "initial indications are that we accomplished the military objectives without interference from Syria".